FUJIFILM Corporation (President: Kenji Sukeno) launches the compact inkjet printer “Frontier DE100 (DE100)” for shops providing photo print services on April 16, 2018. DE100 achieves high quality prints through a combination of newly developed ink and a high resolution inkjet head. Fujifilm has been providing a range of new services including photo prints from smartphones which the demand is growing recently, “Shuffle Print” which arranges a number of different photos into a single print, and “Square Print” which is well-balanced and easily displayed on a wall as part of a interior design. In order to provide these print services at shops, Fujifilm supplies a diverse range of print systems including in-store devices for receiving orders directly from smartphones and other devices where prints can be ordered simply through intuitive operations. The company also supplies minilab systems which allow shops’ staffs to operate the systems by themselves through the combination of printer and software. DE100 is a compact, lightweight, and high quality printer that allows shops to build a diverse range of print systems in accordance with the line-up of their print service, available installation space, and their budget. Fujifilm provides in-store photo print services for photos taken by smartphones and digital cameras. The service is driven by the digital minilab “Frontier”. In addition to silver halide photo system, Fujifilm developed a digital minilab for inkjet system in 2008, and launched the high quality compact printer “Frontier-S” in September 2013 to expand product line-up. People are taking an increasing number of photos by their smartphones which are now widely used, and there is also a growing need to print them. Fujifilm is expanding its print services to meet those needs. These print services which match customers’ needs are popular mainly from young generation. 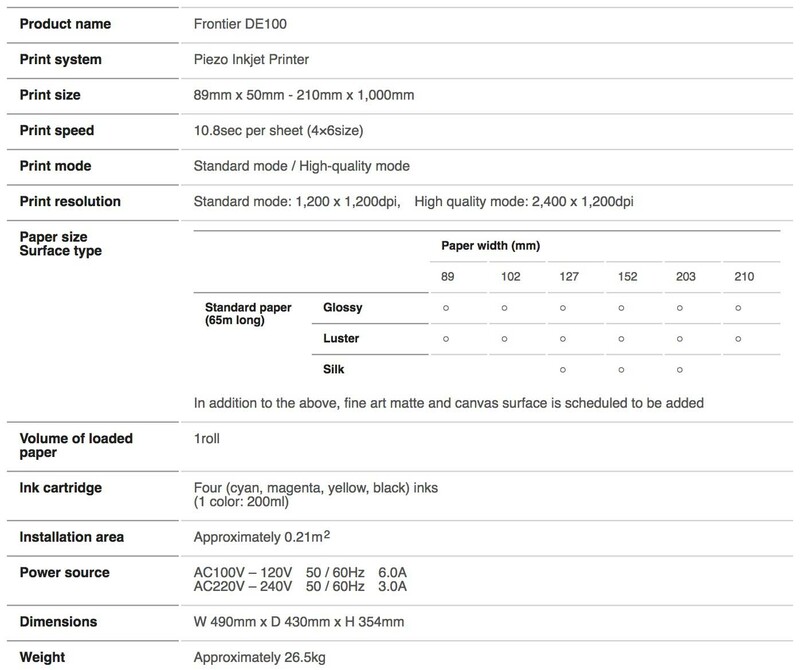 In combination of “ViViDiA D-photo”*, four-color ink originally developed by Fujifilm, inkjet head realizing resolutions of 1200 X 1200 dpi**, dedicated inkjet paper, and image-processing technology “Image Intelligence™”, DE100 achieves superior images to that of previous compact inkjet printers. The product is also compact and lightweight, making it suitable for installation in shops with limited space. In addition, DE100 can handle a diverse range of print sizes and three different types of surface*** such as glossy, luster and silk, each of which provides a different feel to the photos to meet customers’ needs. Fujifilm continues to provide easy and value-added products and services by combining print devices in various output format and software to meet various needs of customers, and thus contribute to further development of photo culture. Through a combination of “ViViDiA D-photo”, newly developed four-color ink using dye highly resistant to ozone and light, and inkjet head realizing resolutions of 1200 X 1200 dpi, Fujifilm has achieved a new system that can accurately apply microscopic ink dots with a volume of just one picoliter*4. Furthermore, in combination with the dedicated inkjet paper and Fujifilm’s proprietary image-processing technology “Image Intelligence™”, the DE100 achieves superior images to that of previous compact inkjet printers that uses multiple colors of ink and dye-sublimation printers by using newly developed four-colored ink. Printing is available in two different color modes. The “natural color reproduction mode” reproduces the “colors as seen” by harnessing the know-how cultivated through silver halide photo print. The “vivid color reproduction mode” is ideal for those occasions where the brighter color tones are required. Two different color modes allow the shops to deliver prints with color reproduction that matches their customers’ needs. *4A picoliter is a unit expressing the volume of ink delivered by inkjet printer. One picoliter is equivalent to 1 trillionth of a liter. From small size prints with the minimum width of 89 mm and feed length of 50 mm through to large prints with a maximum width of 210 mm and a feed length of 1,000 mm, DE100 can produce prints with a diverse range of print sizes. The DE100 can also produce images in a range of different formats including “Square Print” which have become popular among young people due to the influence of social media such as Instagram*5, “Shuffle Print/Wonder Shuffle Print” in which a number of images are arranged together in a collage. In addition, three different types of surface, glossy, luster and silk are available, ensuring that users can enjoy photos in a wide range of different applications. *5Instagram is a trademark and registered trademark of Instagram, Inc. The compact, lightweight design of the DE100 results in few restrictions on installation so that it allows shop owners providing photo print services, or other shops that wish to make use of limited available space to provide new photo print services, to build a small-scale print system appropriate for their establishment. It is also possible to combine four DE100s to achieve high processing capacity of 1,320 images per hour (4×6 size; standard quality mode) to go beyond the capacity of a standard large inkjet printer, making the product appropriate for various applications including print systems in shops providing photo print services where high-speed printing is required. This entry was posted in Accessories, Press releases and tagged Frontier DE100, Fuji Rumors, Fujifilm, Fujifilm Rumors, FujifilmRumors, Fujirumors. Bookmark the permalink. Trackbacks are closed, but you can post a comment.